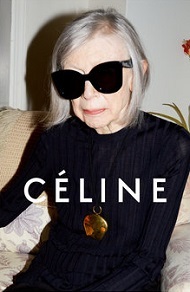 Vive la Joni Mitchell and Joan Didion Différence! Judy Blume for Urban Outfitters: Because a girl buying her first crop top is a total rite of passage. The iconic singer-songwriter, 71, fronts Saint Laurent’s Music Project campaign, which in the past, has tapped other major musicians including Marianne Faithfull, Courtney Love, Marilyn Manson and Kim Gordon. 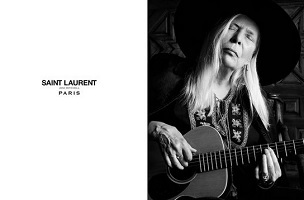 The ads — featuring Mitchell strumming her guitar — were shot at her home in Bel Air, California, by Saint Laurent creative director Hedi Slimane. And of course her outfit is effortlessly cool. Mitchell wears a tunic from the brand’s Folk collection (fitting for the “Woodstock” singer, right? ), classic YSL Fedora and a leather cape that Slimane made for her. There are, right up to this minute, a week’s worth of horrific events happening in Paris. In the deep recesses of a more normal world, it’s also about two remarkable women. W magazine for a separate story has a pair of additional Slimane-Mitchell shots.